Singapore-based, sound innovation company, Xmi Pte Ltd, has launched a range of thumb-sized speakers designed specifically for smartphones and tablets. The X-mini ME and X-mini WE redefine the idea of pocket-size portability and, with a decent sound performance, aim to deliver the X-mini promise of Sound Beyond Size. Both models are perfect partners for smartphones and tablets, letting you take high quality sound with you, wherever you go. The X-mini WE features Bluetooth connectivity to play tracks wirelessly, as well as the ability to Bluetooth-enable any other connected audio device! It also has the latest NFC connectivity, allowing users to simply tap to pair! The X-mini WE comes in a cool Gunmetal Grey, with more colours to follow, and retails at £29.99 while the wired version, the X-mini ME is available now in a fashionable selection of Gunmetal Grey, Yellow, Pink and Blue, and retails at £19.99. 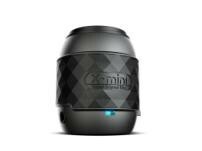 Xmi Pte Ltd’s original X-mini Capsule Speaker range possibly set the benchmark for portable sound quality and is sold in over 80 territories worldwide. The X-mini ME and WE represent an evolution of the X-mini range, and will once again bring a fresh new perspective to the way people think of portable sound. The X-mini ME measures just 44mm in height and weighs only 44gm, with the X-mini WE at 48mm and 48gm respectively. When you need to pump out the sounds, the magnetically shielded, 31 mm drivers, deliver a performance, well beyond the expectations for a speaker of its stature. With just a 1.5 hour charge via micro-usb, giving a playback time of up to 6 hours. Both models come with a carry strap, and a cable with USB, micro-usb and 3.5mm jack connectors. The X-mini WE features the popular ‘Buddy-Jack’ which allows you to connect multiple speakers together for an even bigger sound. The Buddy-Jack is also what turns the X-mini WE into a Bluetooth dongle. Just connect it via 3.5mm jack to any audio system whether it’s an old stereo or a pair of headphones and then transmit your music wirelessly.